Conservation: The Mission Blue, subspecies missionensis, is endangered in California. Loss of native grassland habitat and invasion of woody species has restricted the butterfly to 4 areas on the northern tip of the San Francisco peninsula. The largest remaining population is protected in San Bruno Mountain County Park, where monitoring of the butterfly population and control of invasive species continues. Plebeius icarioides missionensis has The Nature Conservancy rank of T1 - Critically imperiled because of extreme rarity (5 or fewer occurrences, or very few remaining individuals), or because of some factor of its biology making it especially vulnerable to extinction. (Critically endangered throughout its range). New, T. R., editor. 1993. 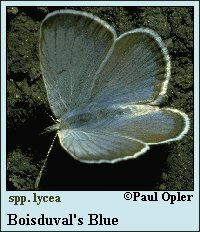 Conservation Biology of Lycaenidae (Butterflies).